Look for a high-quality yet cheap monthly subscription box that doesn’t break the bank? We got you covered! Here are the best cheap subscription boxes that you can subscribe to this month for less than $20. Here are 14 of our favorite subscription boxes under $20 a month. Best of all, most of these make amazing gifts! 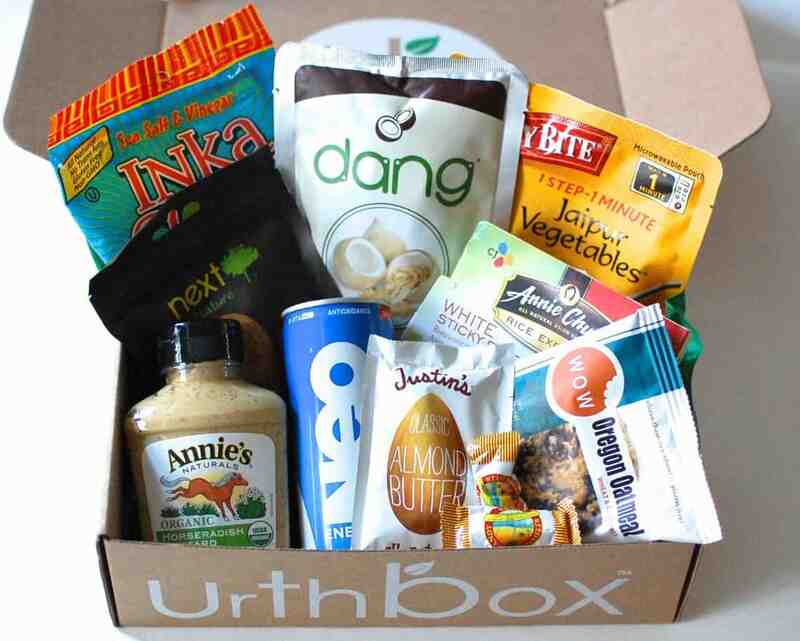 What you get: With Urthbox, you’ll get a monthly box of healthy, all-natural, organic, and non-GMO snacks. Plus there’s even special boxes for vegan, gluten free, and other diets! Coupon / Buy Now: Use the code SNACKBOX10 to get $10 off HERE. What it costs: $13.95 a month plus free shipping. What you get: When you join Loot Crate, you’ll get a box of awesome fandom items like wearables, apparel, comics, collectibles and so much more from some of the best geek franchises. What you get: With Bean Box, you’ll get some of Seattle’s top coffees as well as tasting notes, brewing tips, and artisan chocolate each month. Coupon / Buy Now: Get 10% off when you join HERE. What you get: With Treatsie, you’ll get monthly candy box of artisan sweets and treats from confectioners across the country. Plus, there’s even an option for vegan sweets too! What you get: Inside each snack box, you’ll get 16-20 delicious and healthy snacks all of which are either all-natural, gluten free, organic, or GMO-free. Plus, with each box purchased, Love with Food donates 2 meals to hungry kids in America. Coupon / Buy Now: Get 25% off your first box HERE. What it costs: $20 a month for 2 pairs. What you get: Get fun, stylish, and colorful brand-name socks delivered straight to your home each month. Best of all, you’ll get sock from popular brands like Stance and Happy Socks, just to name a few. What it costs: $20 for 3 months. What you get: Inside each BuluBox, you’ll receive some of the best workout supplements and vitamins delivered straight to your door each month. Best of all, there’s even a BuluBox strictly for weight loss products. Coupon / Buy Now: Get free shipping when you join HERE. What you get: Each month, you’ll receive a curated box of deluxe sized beauty products and samples from major brands and innovative newcomers, as well as a mini Allure magazine. Coupon / Buy Now: Save $5 on your first month when you subscribe HERE. What you get: Inside each Vegan Cuts Snack Box, you’ll get 7-10 vegan goodies such as cookies, sodas, chips, teas, candy, pantry staples, and more. One of our favorite vegan boxes! What it costs: $12.99 a month plus free shipping. What you get: With a Teeblox t-shirt subscription, you’ll receive graphic tees featuring some awesome fandoms and geeky franchises such as Disney, Star Wars, Ninetendo, Harry Potter, and more. Coupon / Buy Now: Get your geeky shirt HERE. What you get: With Graze, you’ll receive a box of 8 healthy snacks in which you can select from over 100 different options. Best of all, you can try it for free! Coupon / Buy Now: Get a free sample box HERE. What it costs: $15 – $20 a month. What you get: When you join this tea subscription, you’ll receive a monthly box of artisan, loose leaf teas as well as some reusable muslin tea bags. What you get: Each month with Treats, you’ll get delicious interactional snacks from a different country delivered straight to your door. Coupon / Buy Now: Use the code URBANTASTEBUDS to get a 15% discount on your first order HERE. What you get: With a Birchbox Man subscription, you’ll receive a box of high quality grooming and shaving products as well as 1 lifestyle product like a shirt, sunglasses, boxers, tech accessories, and more. Thanks for reading and hopefully you find the best cheap subscription boxes under $20! Just don’t forget to use some of those crazy good promo codes. Looking for something even cheaper? Here are 30 of our favorite boxes for less than $10 a month!